Even for us humans, the Australian summer can be unbearable - especially when temperatures soar over 35 degrees. Air conditioners are a necessity, cold drinks and swimming in a pool or beach provide us with some relief, but it’s important to spare a thought for the wellbeing of our furry family members who are also struggling to keep cool! Ensure that you dog always has access to water both inside and outside the house. It’s important to make sure that you have several bowls available to them, just in case one is tipped over or dries out. A good tip is to put ice blocks in them to keep the water cold. You can even freeze containers chicken stock for outdoor animals. Avoid walking your dog during the heat of the day. Remember that animals have sensitive pads on their feet that can also get burnt on hot roads and footpaths. A good alternative is to walk them early in the morning or later in the evening when the ground has cooled down. Be careful not to overexercise your pet. Animals get dehydrated easily as they cannot sweat. You can also get a collapsible water bowl for long walks to ensure you pet has lots to drink. Make sure that you have shaded areas in your backyard to provide protection from the sun. Paddling pools are a great way for animals to keep cool- just be sure to supervise your pets as some animals are not great swimmers (and make sure they have floaties if needed). Also make sure you hose your pet down after swimming in chlorine, salt or chemically treated waters and avoid them drinking it. Water spay mists are also good. Another great idea is putting trays, ceramic tiles or towels in the freezer and then providing these to your pets to lie on. You can even wipe them down with cold wet towels. Even most cats will allow this when the weather hits extreme temperatures. 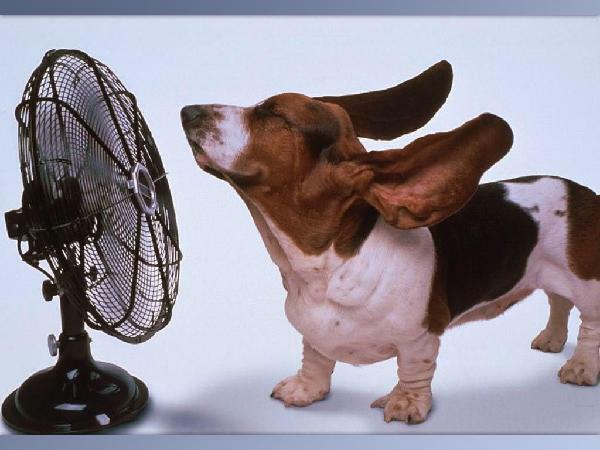 Allow outside dogs inside to cool down in front of the air conditioner or fan. Never leave any dog in a hot car even for a few minutes. Heat stroke can occur quickly - (within 6 mins) particularly for those with flatter faces like bulldogs and pugs. Even with the window down - the heat inside a car can rise from 30-60 degrees in just 10 mins! Know the warning signs of heat stroke- excessive panting, salivating, disorientation, diarrhoea, vomiting and fatigue can all be signs your dog isn’t coping with the heat. Older animals and those overweight can be more susceptible to heat stroke. Feel free to trim your dog’s coat but do not shave them completely. Dogs coats help protect them from the sun and regulate their body temperature. Never let your dog chew on dead fish they find at the beach - they may be poisonous - especially blow fish. Cool them down immediately with a cool bath or hose them down. Once wet-dry them in from of a fan or air conditioner. Take them to your nearest vet (Keeping them cool on the way there) animals can have internal bleeding or organ failure and can still be at risk of death hours or even a couple of days after suffering heat stroke.